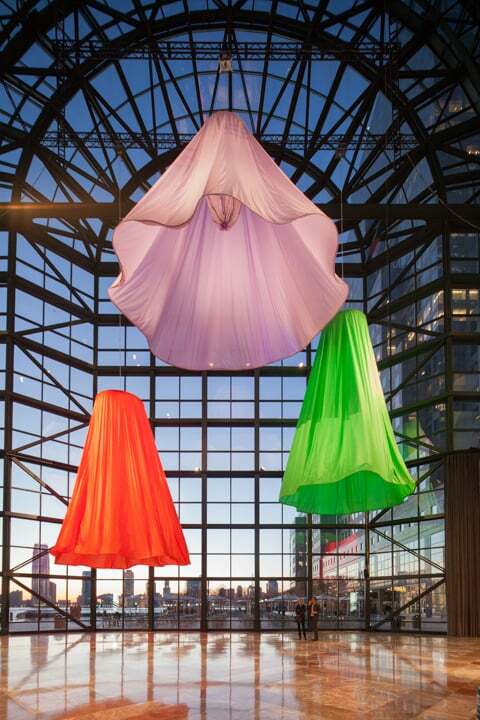 Soft Spin was a sound and sculptural intervention developed for the Winter Garden atrium at Brookfield Place, New York. 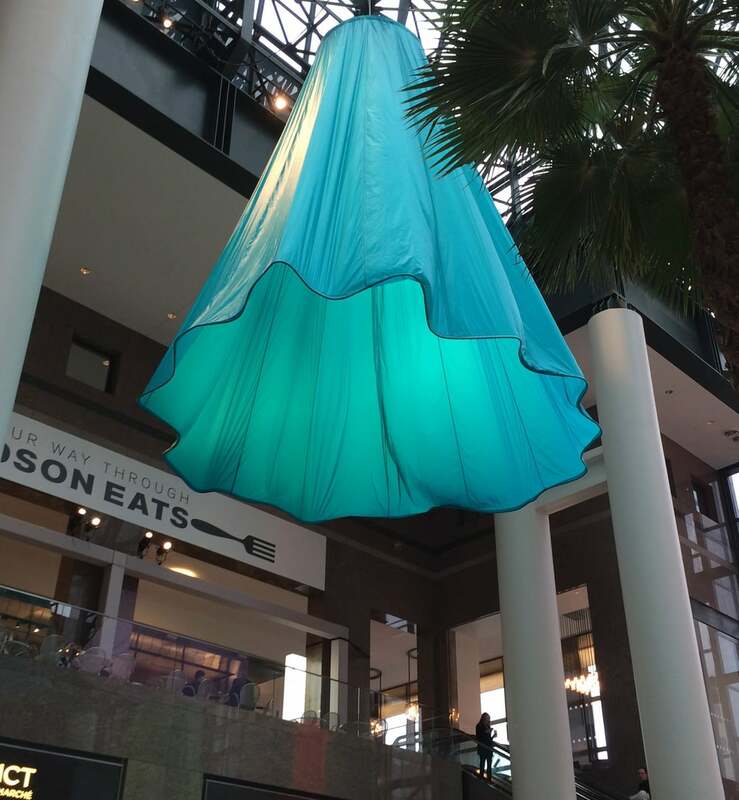 Six enormous fabric forms gracefully swirled overhead, emanating the sounds of intermittent voices in song. Set against panoramic views of the World Trade Center at one end, the magnificent Hudson River on the other, and sheltered from the ever-changing sky above, the space is a busy public environment. While gender equality has improved over the several past decades, with it has come broader issues of self-expression and further glass ceilings. Soft Spin probes these strides, while questioning the limits. What are the constraints we all live with? What is it to occupy space with confidence, to be splashy, to be colorful, to sing and dance? How big can you be? Soft Spin was an exploration of the pleasures and anxieties of being in public. Whether preparing for an appearance at a celebration, event, or important meeting - the plans, expectations, and potential for dashed hopes intersect with notions of style and personal identity in a struggle for both acceptance and exceptionality. 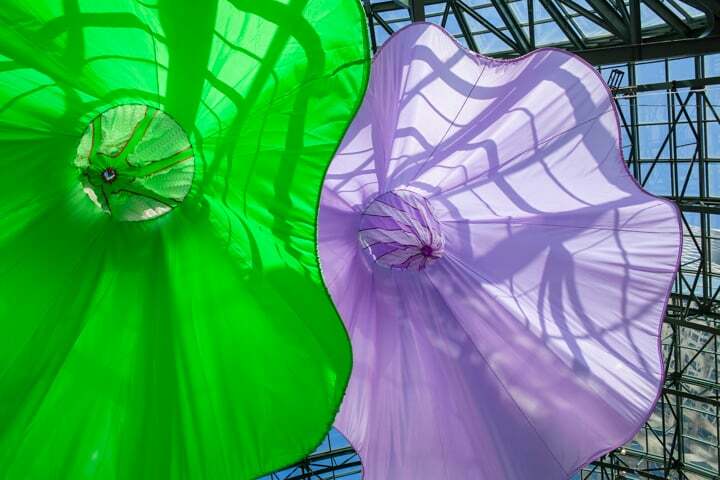 In a bow to the Winter Garden’s rich contemporary history as a performing arts venue, Soft Spin plays with notions of being in the spotlight, on display, or playing a part. The audio score was inspired by the secret bravado of singing “show tunes” in the shower, introducing the surprising sound of private voices cheekily interrupting the conventions of public interaction. Fluctuating between individual and group voices, the unexpected sonic incursions mirrored choral traditions of call and response. With its oversized juxtapositions, Soft Spin encouraged reflection on the intersection of our private and public selves, our daily navigation of social expectations, and our desire to be seen and heard.